Flat Apple Pie with Perfect Pie Crust | Rosetta Bakes! I love apple pie, apple dumplings, apple sauce, apple cake and apple bread, so…. when I saw a recipe the Pioneer Woman recently made of “The Food Network” I had to make it, besides it looked pretty easy to make! I decided a pie crust is a pie crust so I used my favorite pie crust recipe instead of the one Ree used in this recipe. I suppose I should have used her recipe instead to know how it really turns out, but I was very happy with the results using the pie crust I always use. I’ll post the recipe Ree used for her pie crust, and then I’ll post the one I used. Her recipe uses more flour, so the pie crust will be larger. Also, I love cinnamon in apple pies so I added cinnamon to my dry ingredients, but this entirely up to you. Another change I did was to brush the crust with egg wash and sprinkle with sanding sugar. 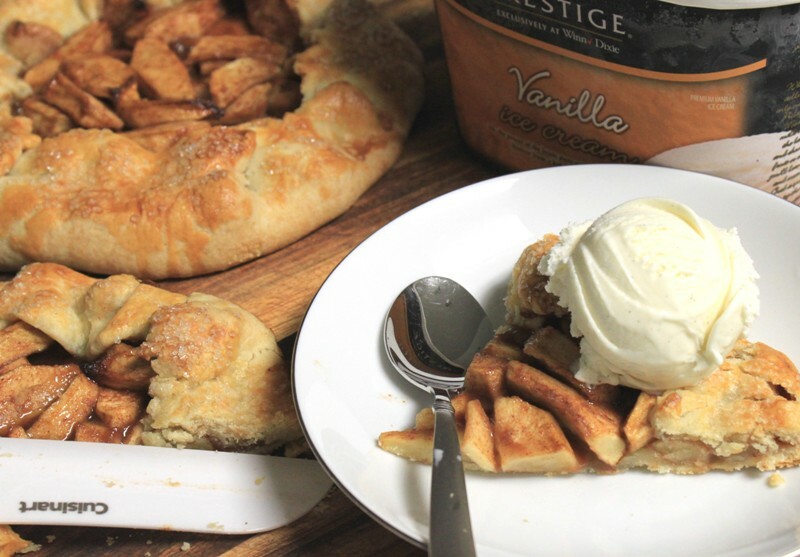 Anyway, I hope you enjoy this easy apple pie as much as I do…besides it’s so easy to make! In a large bowl, stir together the apples, brown sugar, granulated sugar, flour, salt and lemon juice. With a rolling-pin, begin rolling out the pie crust into large circles. Roll the dough from the center outward into large circles. If you think the bottom pie crust is sticking to the surface below, use a nice sharp spatula to loosed the dough and sprinkle some extra flour on top. Then flip it over to finish rolling. Remember to roll from the center in single outward strokes, no back and forth rolling. Again with a spatula, loosed and lift the dough and carefully place the circles on large baking sheets. Place half the apple mixture on one crust and the other half on the other crust. 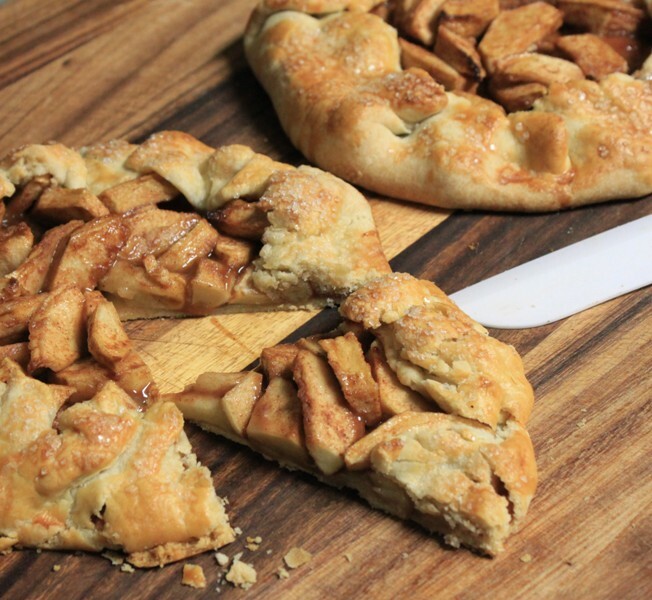 Fold over the edges of each crust so that it covers 2 to 3 inches of the apple mixture. No need to be artistic – the more rustic the better. Dot the tops of the pies with chunks of butter. *Brush with egg wash and sprinkle with white sanding sugar. Bake until the filling is golden and bubbly, 30 to 40 minutes (I baked mine for about 50 minutes as each oven is different). If the crust browns too quickly, cover the edges with aluminum foil for the remaining baking time. *I bake mine on stone…but a baking sheet with parchment paper would work great also. Allow to cool slightly, then slice into wedges with a pizza cutter or sharp knife. Combine the flour and salt in a large bowl. Add the butter and shortening. Using a pastry cutter, gradually work the butter and shortening into the flour until the mixture resembles tiny pebbles. This step should take 4 or 4 minutes. lightly beat the egg with a fork, and then add to the mixture. Next, add in the cold water and vinegar. Stir the mixture together until it’s just combined, and then remove half the dough from the bowl. yield dough for 2-pie crusts. Serves 16* (2 pies, 8 slices each); Calories: 371; Total FAt 22.5 grams; Saturated Fat 10.5 grams; Protein: 3 grams; Total carbohydrates: 40 grams; Sugar: 19 grams; Fiber: 2 grams; Cholesterol: 48 milligrams; Sodium: 191 milligrams. Chill all ingredients ~COLD~ every important! Put flour, salt and sugar in food processor and pulse to mix. Add cubes of butter and pulse till crumbly. Pour ice water in side chamber tube and pulse till crumbly and moist. (until dough pulls away from sides of food processor and forms a ball). Form into a ball on a lightly floured board and divide into 2-disks. Place in plastic wrap and cover all edges and press to flatten into a disk. Refrigerate till ready to roll out. If freezing, cover with wrap and put in a zip lock and freeze for up to a month. Thaw in plastic wrap until thawed enough to roll out. Chill dough after placing in pie pan till firm. Thank you Susie, it was delicious! In west Virginia we would never use a Granny Smith Apple. They have no flavor, stay hard as a rock, and are not sweet. In all of my apple pies I use Golden Delicious. I’m from West Virginia also. I think it’s a preference really, to me both work well.